In the mid 1830s, Chauncey W Ferris and John P Cook traveled to the Michigan wilderness just north of the Ohio / Indiana border. Chauncey was the fifth great-grandson of Jeffrey Ferris through Joseph. 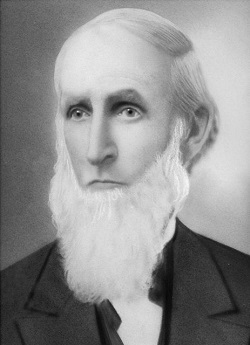 Born in 1811 in Cato, New York, he was destined to have a role in the establishment of one of America’s most unique colleges. Hillsdale College prides itself in not taking any Federal aid. It is a bastion of conservative values, scholarship and opinion. Its current offerings of on-line courses on a variety of historical and political topics is unmatched by any other right of center institution. Hillsdale College was founded as Michigan Central College in Spring Arbor, Michigan, in 1844. Nine years later it moved to Hillsdale and assumed its current name. In 1844, at Spring Arbor, a group of free-willed Baptist organized and opened a pioneer school of higher education called Michigan Central College. Primarily due to the access of the railroad, the college relocated to Hillsdale in 1853 and was renamed Hillsdale College. Two original Hillsdale settlers served as college trustees for many years. Chauncey Ferris was elected the first treasurer in 1853 and John Potter Cook served for more than 20 years. There was a dearth of women in the wilderness of Michigan, and Chauncey and John traveled back to Cato, New York for wives. Between them, the two men married five women, becoming brothers-in-law three times in the process. The resultant 24 children, some of whom didn’t survive to adulthood, had confusing familial relationships where siblings were also cousins and a man could be both the father and an uncle to his children. … John and Chauncey had established retail businesses and banking ventures with different partners. Both men made a great deal of money—mostly from land sales and lumbering—and served their community in several political positions. Both men were deeply involved with the early Hillsdale College. … Chauncey’s part in the fledgling county isn’t completely forgotten. Chauncey and John, good friends in life, remain connected in the town of Hillsdale, where the streets of Ferris and Cook meet at the now-abandoned mill behind St. Peter’s Lutheran Church. As one historian wrote of Hillsdale in the early 1900s, “Hillsdale College has been a pioneer in the educational reforms of the age. From the first it has given the same advantages to the colored race as to the white. It was the first college in the State, and one of the first in the country, to admit ladies to rights and privileges equal with gentlemen.” (Quoted in Arlen K. Gilbert, Hillsdale Honor, 4). Hillsdale can claim having sent over 500 students into the Union armies; among this group were three generals, three colonels, five lieutenant colonels, and three Congressional Medal of Honor winners. Chauncey Washington Ferris had three wives, Julia Marie Smith (m. 1838), Catherine Ann Wolford (m. 1844) and Phebe Elizabeth Hedges (m. 1851). He fathered six sons and four daughters, and six of the ten survived childhood. Chauncey died in 1889 and is buried in the Oak Grove Cemetery in Hillsdale. Excellent website, excellent writing with much interesting subject matter. My surname society has a somewhat similar website, but the manager does not, unfortunately, have your talent for creativity and writing. You have created an interesting and valuable online resource. This is the first edition that I have been privileged to receive. Many thanks. Now, if I could only find my Ferris Family who disappeared into Ohio from northwestern Pennsylvania, originally from Chautauqua County, NY. By-the-way, my wife’s ancestors came to western New York from Cato in Cayuga County, NY, also.